JEGS GS-1 High Back Sport Seat fits universally into any car on both driver and passenger sides and weighs only 36.5 pounds. The 2009 Dodge Challenger Drag Pak had two driver's side Dodge Viper seats. Midway through the 2010 model year, Mopar switched to JEGS GS-1 High Back Sport Seat #555-70240. 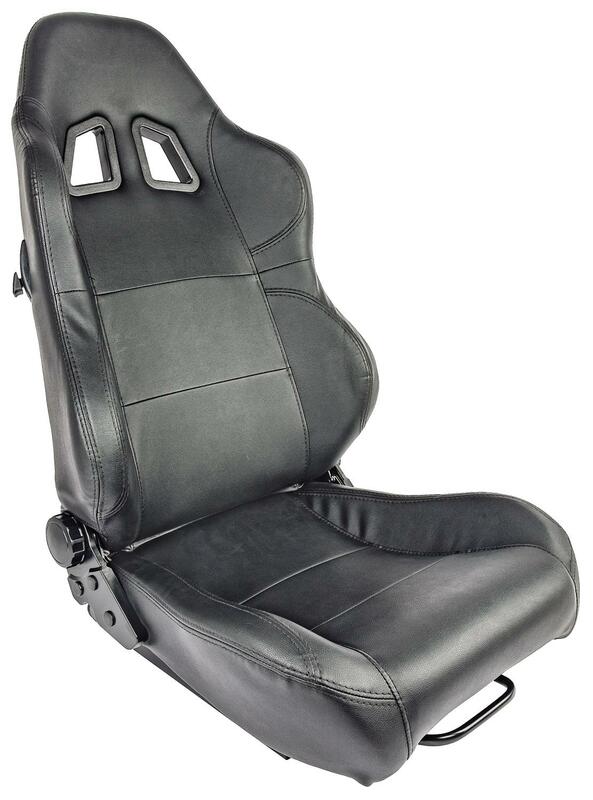 JEGS GS-1 High Back Sport Seat weighs less than a Dodge Viper seat, and uses a different seat mount (#555-70225 sold separately). Adjustment features include: left and right rear tilt forward levers, left and right rotary recline knobs, and front side-mounted slide lever. 70240 is rated 3.8 out of 5 by 38. Rated 5 out of 5 by PatrickH from Great quality, Fits mustang! I think the "leather" quality is more than acceptable for my build and overall I'm pleased with the seat functionality. I wanted to point out that the seat sliders perfectly line up with my 1969 mustang stock seat mounting holes. I was pleasantly surprised I didn't have to make brackets! Rated 5 out of 5 by Rcarter from Great seats for cheap I bought these seats a few weeks ago and they are great quality for the price. The seat brackets are made out of good steal and are a lot better than what came originally on my 78 camaro. Rated 5 out of 5 by JoJo Smash from Great seat for the money. $ for $ these are steals. Brackets align right up to factory holes in 70 Mustang coupe. Overall, very comfortable; I'm 6'1" 215 lbs with big shoulders and I don't feel squished at all. Kills to birds with one stone: my factory seats were trashed and now I can run 5-pt harnesses, also my 70 seats don't recline. Time will tell how durable they are. Rated 5 out of 5 by JmBStudio68 from Excellent! I bought this seat for my Racing Sim setup. It exceeded all my expectations. Super solid, fully adjustable and very comfortable. Im 6'1" and my shoulders do hit the upper side supports when I pull my shoulders back. When they are on the wheel and Im racing, it fits just fine. Ive seen some complaints about this issue and I do not believe is is the products fault....it is a real racing seat and those are designed go fit snug, hence the cutouts in the back support for a 5 point harness. Rated 5 out of 5 by Seth hollis from Best cheap bucket seat out there Im just a broke high-schooler building a 79 bmw (which had horrible seats) so I went ahead and ripped them out and began looking at cheap bucket seats. (Hint, don't go ebay.) This seat fit beautifully in my car with just a small modification to the bracket (as is expected) and you can tell it won't break without seriously rough use. If you want recaros for $150, don't expect them to be recaros but these will be your best bet. The only issue i have with them is to adjust the lean of the back half you have to turn a difficult knob rather than simply pulling a lever, but my bracket has another lean feature so it's not a big deal for me. Rated 5 out of 5 by Swifty161 from Great Seat for the money So I figured if it was good enough for an OEM to use in a “flagship” car it was good enough for me. Got the pair on sale for $300 shipped. They arrived pretty quickly for such large items. They are quite comfortable (I’m 6’2” and 195#) they shaved about 10# out of the car. My only complaint is that the low mount brackets I had to get else where forces me to have the driver seat a bit too far to the left (thanks GM for offset seat studs in the 4th gen Fbody) other than that the slides mounted easily to the seat with supplied hardware. I have plenty of room for wearing my helmet. The seats still allow ease of use for the shifter. After reading some “ok” reviews on the Sparco R100s I figured I’d try my luck with these. The “leather” is supple and soft, adequate padding since I likely won’t ever have long trips in the Camaro. Highly recommend these seats!! Rated 5 out of 5 by Led344 from Great features! I bought this a month ago and I am so happy I did! Great product. Great price! Rated 5 out of 5 by Bird of Prey from I have been anticipating a sale of such seats for a long time. I don’t need $2500 seats for my application. These seats are built strong and easy to assemble and are prefect for my car. what adaptor would be need to make this fit in a 1998 jeep cherokee? This seat will fit many of the factory seat mounts. There are no adapters for your Jeep, but you should be able to make it work. Will these fit into a 1992 Mustang LX? Just bolt &amp; go? Mounting bracket needed for 67 Camaro? These have build in sliders correct and will not require #555-70220 Just the 555-70225 brackets to mount correct? Yes, these seats have sliders and can be used with the pedestal mounts. will they fit in a 76 corvette? Do they come with the mounts shown in the Picture and will the seats and mounts work in a1991 chevy s10? This comes with slider mounts, you will have to adapt them to work with your factory S10 seat mounts. If I am bolting these into a flat floor do I need a bracket or will it bolt straight down? This will bolt to a flat floor with the sliders that are on the bottom of the seat. Want to use these in my 97 Jeep Wrangler, is there additional hardware needed to use these? You will want to adapt these to your original seat mounts.